Limits to innovation – how far can smartphone design evolve? The big-screen phone is dominant, but what comes next? Those of you old enough to vividly recall the age of the 'feature phone' will no doubt have fond memories of the weird and wonderful range of devices produced by the likes of Nokia, Sony Ericsson, LG and Samsung. We had flip phones, swivel phones, gaming phones, music phones and much more besides, with each product trying its hardest to differentiate itself from the competition and offer something truly unique; a hook that would make it more appealing than its rivals. Those days are long gone, and the smartphone market is far more homogenized these days; phones are almost indistinguishable from one another thanks to the fact that the screen has become our primary means of interaction. There's only so much you can do on a design level when the front of your device is taken up almost entirely by its display. This paradigm shift occurred when Apple launched its first-generation iPhone back in 2007; while it was far from the first company to dream up the concept of a handset with a screen and no keypad, it pushed the market irrevocably in that direction, triggering one of the biggest design changes the mobile tech industry has ever witnessed. "This change was no doubt a revolution in terms of usability," says Paavo Pietola, award-winning designer and CEO of Helsinki-based design studio D&A. "Though for some it meant deteriorating text input, others who were into more visual content enjoyed the enhanced freedom in handling that content." The move to touchscreens didn't just enrich interaction; it led to the smartphone becoming our biggest data conduit – for better or for worse. "I tend to think that touchscreens were one important factor in a bigger shift of all the information being accessible through the mobile phone," Pietola continues. "I think it is not so much how you use the phone, but what you use it for. "Omnipotent mobile phones have profoundly influenced the lives of billions because phones are used for virtually everything. User interfaces will evolve still, but the fact of a majority of humans beings spend a great part of their waking hours hunchbacked over their phones is a phenomenon so vast that its significance is yet to be learnt." The speed at which the mobile industry ditched physical keys was dramatic, and now only Blackberry continues to sell phones with keyboards – and even then, the display remains the primary means of interactivity. However, designers like Pietola are focused on predicting future trends and changes, and know full well that things can change overnight – just as they did in 2007. So are we ever likely to see another upheaval in the near future, or are there limits to innovation as far as usability is concerned? Big-screen phones are ubiquitous because they provide the perfect way to accommodate interactivity as well as dynamic content, but any 'new' interface is going to have to provide pretty striking improvements to be seen as a logical step forward. For Pietola, the advent of 'non-physical' interaction – such as voice commands and 3D object scanning – presents perhaps the most obvious path forward. "I believe there will be more diversification," he says. "Lower-end traditional physical inputs will be challenged by high-end, AI-facilitated non-physical input. The question is how new ways to use mobile devices fit into the surrounding culture, or how the culture will adapt to these new ways. From a technology point of view, it is not hard to envision a fully non-physical UI in the near future." Indeed, this is something that could happen right now, Pietola attests; the tech is already maturing thanks to Google Assistant, Siri, Alexa and phones with incredibly accurate face-scanning technology, like the iPhone X. 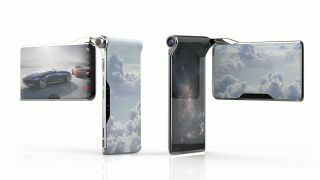 While some may consider the smartphone to have evolved as far as it possibly can, Pietola believes that in the next few decades we could see the most precious piece of consumer technology in our lives adopt a totally different form. It may even cease to exist, and instead, people will go 'device-free' without sacrificing any connectivity. Imagine a future where every mirror in your house is a potential touchscreen or display; screens in your car could relay information such as text messages and emails. As electronic paper becomes even cheaper, we could see disposable ways of accessing data – an ironic throwback to our paper-based past. All of these displays could be connected to the web, using biometrics to identify the current user and only display information relevant to them. Going totally device-free might seem like a pipe-dream, but it's a potential future. Is going device-free the future? As a designer and futurist, Pietola's job is to figure out how such technology can be factored into our everyday lives, although he readily admits that we may never truly be rid of smartphones, purely because we crave tangible objects. "Content is now becoming free of individual terminal devices, and I think the same will take place in communication," he says. "Users will be free from individual devices as people will have access to communications and data networks as individuals. Seeing, hearing, being seen and heard will be carried out in many new ways that fit into the situation the user finds themselves in at any given moment. However, the human tendency to have affection for objects will surely remain and will still be a driver in development." He has a point; many people will readily admit that their smartphone is the single most important object in their everyday lives. It's a communication tool, an information tool and an entertainment tool, all wrapped up in a device which is small enough to fit in your pocket. How the phone will evolve over the next decade remains to be seen; we could move towards using voice commands rather than typing, or perhaps multiple screens are the way forward, offering different perspectives and increasing our multi-tasking potential. Whatever happens, there's almost certainly a limit to what the smartphone in its current format can do – and spotting the next significant change is a challenge that designers like Pietola thrive on.